This Chicken Jalfrezi Recipe is probably going to be one of the easiest recipes in your arsenal. When I say “yours”, quite frankly, I am sure you will enjoy cooking and consuming this dish. Let’s see what Chicken Jalfrezi Recipe is about, shall we? There are so many different versions of this dish, your head will go round and round trying different ones from online food blogs. I personally make two kinds. This recipe, which I am about to introduce to you, was given to me by my dear friend, Nida. I also have another one, which is a little more complicated and has a thicker gravy to it. Frankly, I love both. I make today’s recipe when I am very short on time. The other one, which I will introduce to you later this month, requires some advance prepping (nothing you can’t handle). But it tastes DIVINE! Be sure to give both a try. 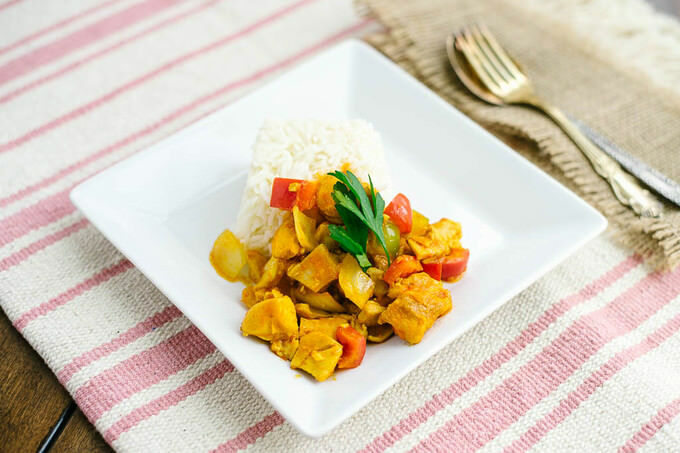 This Jalfrezi chicken recipe has like 8-10 ingredients in it. Almost all of these ingredients are either available in your home, or you can easily get them without resorting a drive to a local spice shop. I sometimes add extra spices to it, depending if I want to variate the taste. Otherwise, I stick to these 8-9 ingredients. This recipe is both Paleo and Gluten Free. 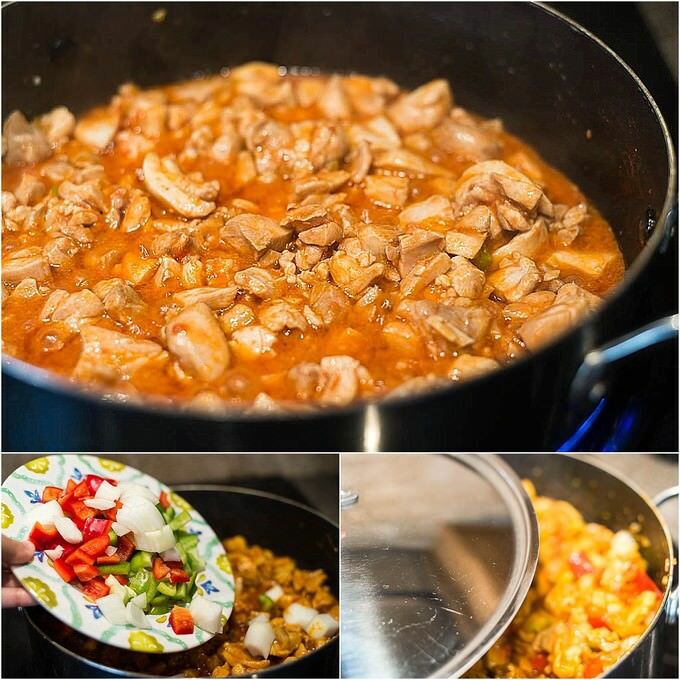 I hope you will like this recipe as much as we do! First prep all the ingredients which you will be using for this recipe. It will save you time till you get the hang of this recipe (or any other recipe). Chop up the garlic, thinly slice the chili pepper, dice (in inch) bell peppers, and dice the onion (1 inch). 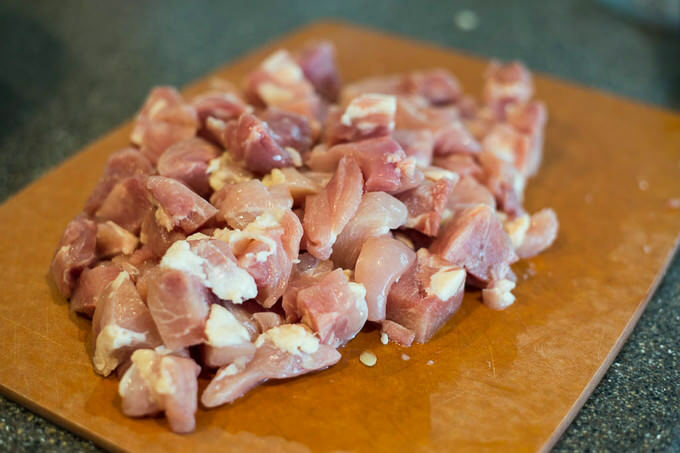 Cut the chicken breast or thighs into bite size pieces. Place a medium size skillet on the stove top. Add the oil and add the chopped garlic. Turn the heat on to medium and let the garlic cook a little. Be careful not to burn it, it will cause a bitter taste to your Jalfrezi dish. 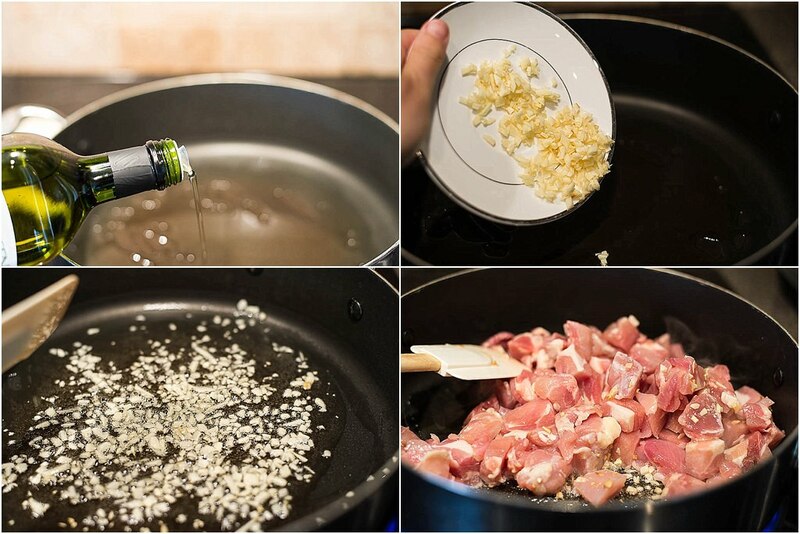 When garlic start blushing just a bit, add the chicken and turn the heat to MEDIUM HIGH. Add 2 TBSP of vinegar and mix in with the chicken. 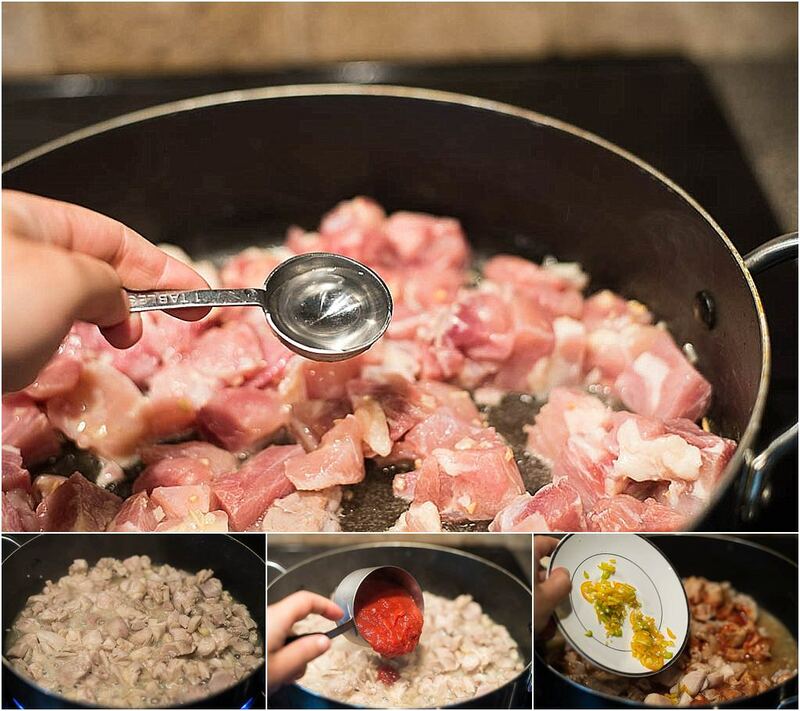 Stir the skillet once or twice until the meat is no longer pink. Vinegar acts as a tenderizer to meat. So, there will be no reason to cook it for a long time. Turn the heat down to MEDIUM again. Add crushed tomatoes, chopped chili pepper and let tomatoes cook down a bit, for 2 minutes or so. 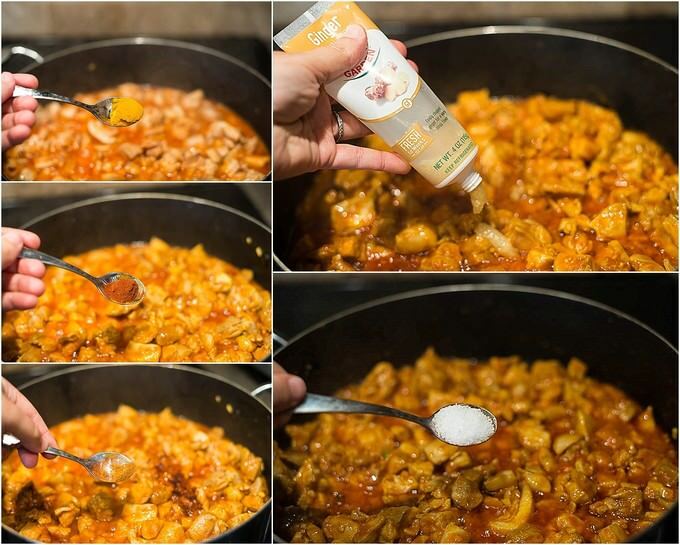 Add 1 tsp of turmeric powder, 1 TBSP ginger paste, 1 tsp of paprika, 1 tsp of salt and 1/4 tsp of chili powder (optional). Mix everything well and cook for another 2 minutes. Add diced vegetables into the skillet, mix all the ingredients together and turn the heat down to medium low. Close the lid of the skillet and let the whole thing cook for about 2 more minutes. There is no reason to overcook the vegetables. You should be able to feel the slight crispness of peppers and onions. 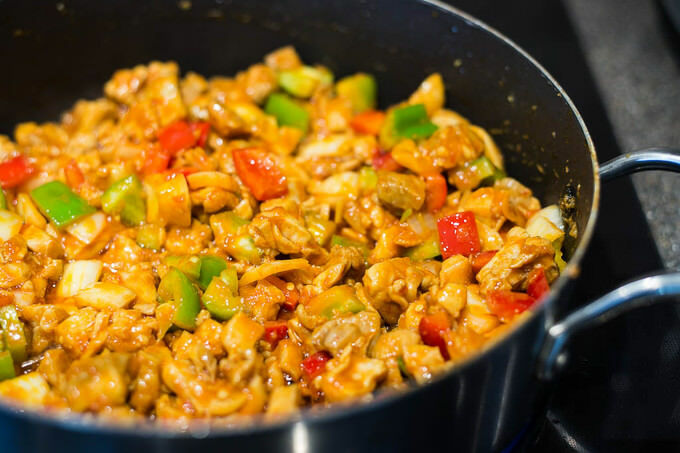 There goes your simple yet delicious Chicken Jalfrezi Recipe. Garnish it with chopped cilantro and serve with either rice or a salad. I like to pile my portion on my favorite green salad. If you are going to give it a try, I would love to hear your feedback. First prep all the ingredients which you will be using for this recipe. It will save you time till you get the hang of this recipe (or any other recipe). 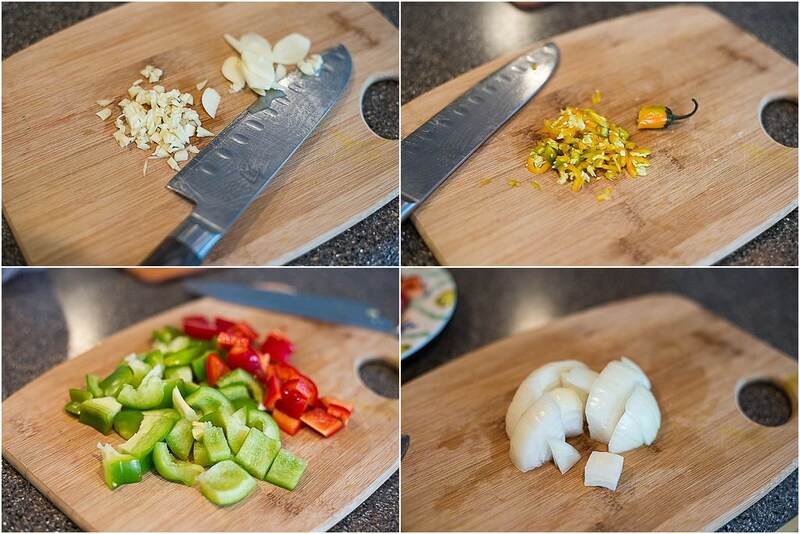 Chop up the garlic, thinly slice the chili pepper, dice (in inch) bell peppers, and dice the onion (1 inch). Cut the chicken breast or thighs into bite size pieces.